Chimney Caps, Dampers and Accessories | Chimneys | Kent Chimney Inc.
We are a chimney repair company that prides itself on offering premium guaranteed accessories our customers need for their fireplaces. Whether you need a critter cap to keep out raccoons or a chimney damper to prevent energy loss, we’ve got you covered. 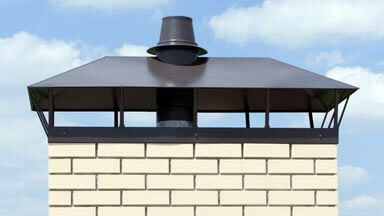 A critter cap (also called a chimney cap) is designed to keep critters out of your chimney. To animals, your chimney looks a lot like a hollow tree trunk. To a mama raccoon, your chimney looks like the perfect place to raise her babies. Without a critter cap, raccoons, squirrels, birds and other animals can go into your chimney or even into your house if you don’t keep the damper closed. Chimney caps can also keep rainwater out of your chimney if the chimney damper is open. A chimney damper is essentially a door inside your chimney that can be opened and closed with a lever or pulley. A chimney damper prevents drafts so heated or cooled air doesn’t escape up the flue. Not only do premium dampers prevent energy loss, and keep out the rain and snow. If you are interested in learning more about critter caps, chimney dampers, and other chimney accessories, give us a call at (616) 949-7722.